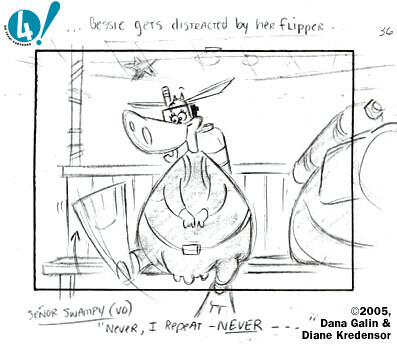 The Frederator Studios Blog: Diane Kredensor & Dana Galin. Oh Yeah! We're working with Diane Kredensor and Dana Galin on a book for our pre-school book imprint with Bolder Books for Boys & Girls and Random House. And today they showed us at Oh Yeah! Cartoons their charming and fun cartoon, Call Me Bessie! Thanks to Diane and Dana for kind permission to show a storyboard frame from their cartoon. I know the popular expression is "don't have a cow," but, here is one fine cow that we should have. I'm so excited about the show, I can't wait to see it! I know Diane is an extremely talented, creative artist and writer and Dana is an exceptional writer as well, so I'm excited to see what these two powerhouses do together. Good luck y'all, I'm looking forward to seeing the fruits of your labor! I really enjoyed Dianes work on Pinky and the Brain. I can't wait to see how good this will be! I love the cow! I know how great Diane's work is, and I know how funny her and Dana are together. I'm betting this thing will be a laugh riot! I'm so proud of you and to have you as a friend. Good luck! Got milk? WOW! Can't wait to see it! You guys are great! Congrats! Go ladies!! I am so excited for you both! Dana, you're one of the most creative people I've ever met and I knew one day I'd be like "hey, I know her!" Looks like that day's on its way. I don't think I fit the show's demographic, but I'll be watching... Congrats again!